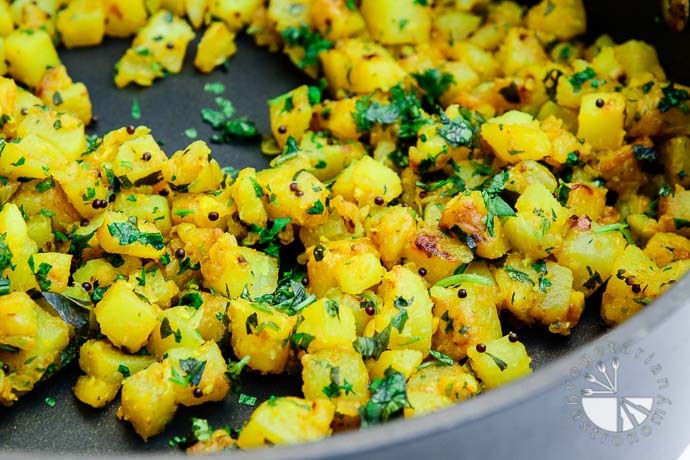 Potatoes have always been an essential part of the Indian Cuisine. I can easily think of tons of Indian Dishes containing some form of Potato, spiced and cooked in different ways. 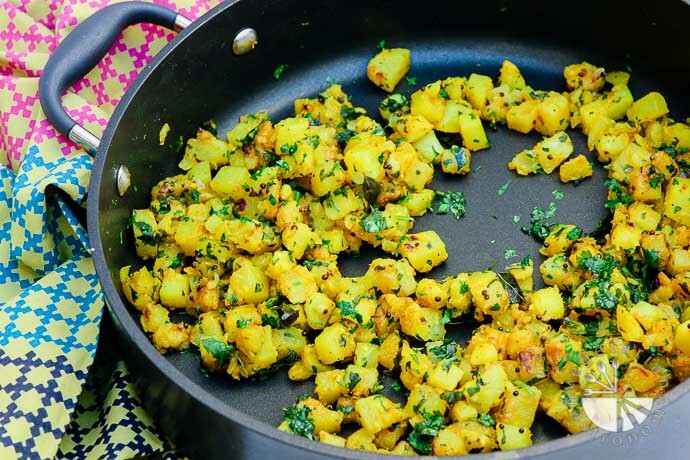 Out of the handful of Indian Potato Dishes I have tried, aside from my Potato Fritter Sliders, this dish is probably one of my favorites. It is one of the more simpler potato recipes I’ve made, yet the flavors all go so well together. This is my version of the perfect potato dish, and I call it Lemony Potato Masala. If any of you have ever had Dosa, a fermented crepe made from rice and lentils and a staple in South Indian Cuisine, you know about the potatoes you get inside when you order a Masala Dosa. I used to love ordering Masala Dosa at South Indian Restaurants but stopped years ago, because I found that the flavor and texture of the potatoes inside were always a hit or miss. We also don’t typically go out for South Indian Food anymore, mainly because most restaurants actually use a small amount of gluten in their Dosa batter (which my brother can’t tolerate). Fortunately, my mom regularly makes us dosas. Not only does she make a healthier batter, which always tastes great, but her potatoes are always perfect in every way! So following tradition, I started making my own Dosa batter at home (recipe coming soon), and I knew I needed to perfect my own version of masala potatoes to serve alongside Dosas. Perfect in texture, just the right amount of acidity and sweetness, and awesome in flavor. These potatoes are very versatile. Not only are they perfect to serve with Dosa, but they also make for a great sandwich filling when making a hot Panini, or you can enjoy them with your favorite tortilla. I’ve even been seen to devour a hot bowl of these potatoes by themselves…yes, they are that tasty! 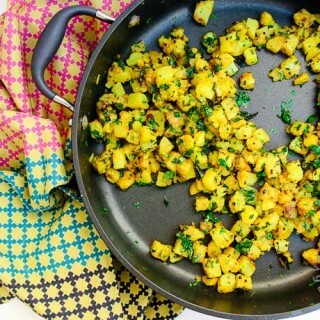 My kids love Dosas and these Potatoes and frequently ask to eat them for dinner. 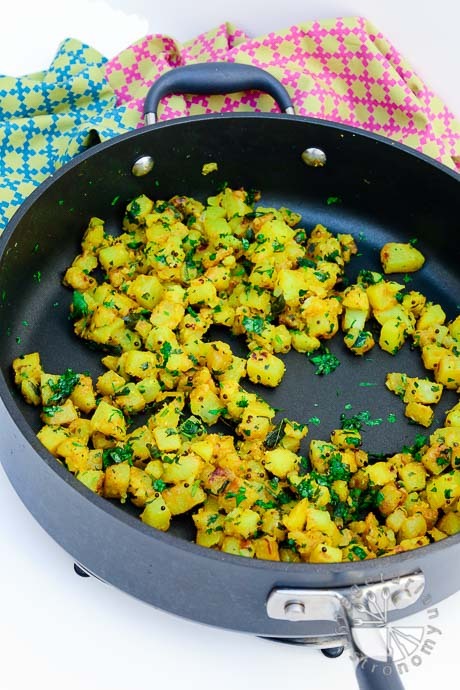 Here is my Lemony Potato Recipe, and be on the lookout for a Dosa recipe coming soon! 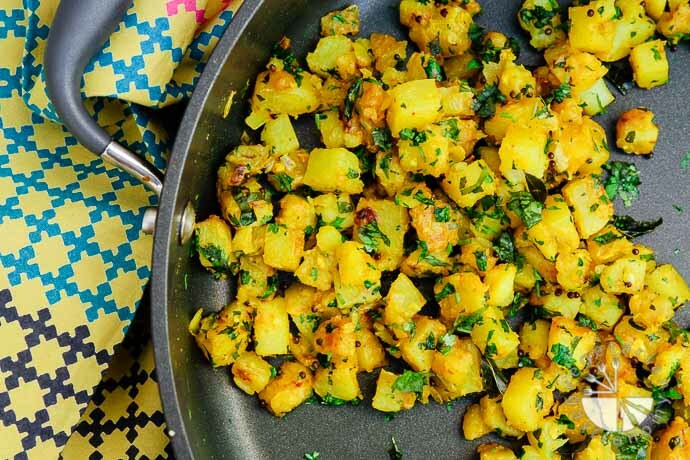 These Lemony Potatoes are the perfect side, breakfast burrito filling, or Dosa filling! Dice the peeled russet potatoes into small cubes. In a large non-stick pan, heat the oil on medium heat. Add the mustard seeds and curry leaves and fry until fragrant. Add the minced garlic and ginger and fry until fragrant, for ~30 seconds. If using, add the freshly minced jalapenos (amount depends on preferred level of spice). Turn the heat on medium-low. Add chopped onions and saute until they start to become translucent. Add the diced potatoes. Mix to combine. Add a tiny amount of water (2-3 tbsp) and cover the lid for the pan. Cook covered, stirring occasionally, until the potatoes are tender and cooked but still hold shape. This may take 15-20 minutes. Half way through, add the turmeric powder, salt, ground cumin, fresh lemon juice, and sugar. Mix to combine and continue to cook the potatoes, covered, until tender. If you feel like the potatoes are starting to stick to the pan and burn, add tiny amounts of water as needed (the moisture from covering the pan should also help). Once the potatoes are done, uncover the pan, and evaporate any tiny amount of liquid remaining on medium heat. If needed, adjust the amount of salt, lemon juice, and sugar to taste. Lastly, add the freshly chopped cilantro, mix, and cook for another few minutes. Turn off the heat and serve hot as is, or alongside some Naan, fresh roti, or Dosa. Seasoning - Depending on the level of acidity of the lemons you are using, you may need to adjust the amount of salt, fresh lemon juice, and sugar at the end to taste. Potatoes - If you end up over-cooking the potatoes and they do not hold shape, it'll still taste great, just have a different consistency. Aww, thanks for this lovely share... I had never thought that lemon and potatoes could match so yummy well! Thank you!! 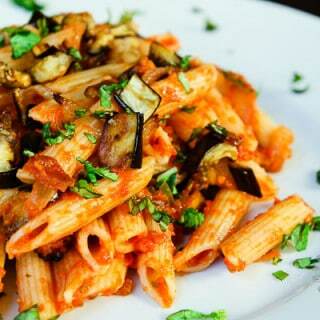 I love this recipe...the flavors really do pair well together. 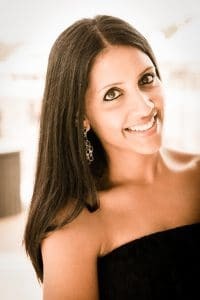 If not with Dosa, I love it as a filling into a Panini Sandwich! 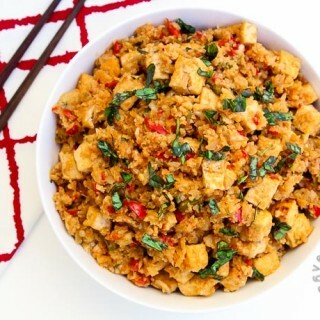 Let me know if you get a chance to try out the recipe! Thanks Shannon! 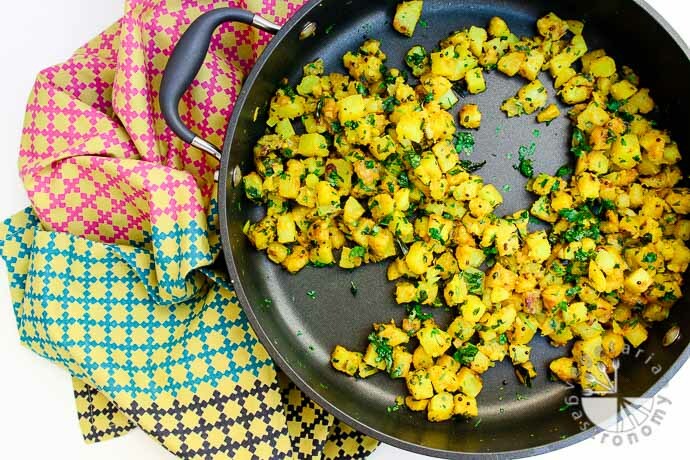 This is one of my favorite potato dishes...the yellow comes from the turmeric! Hope you get a chance to try them out, they are delicious! Lemon in potato test good. To use turmeric is good-healthy.